The local elections were less than good for the Labour party – and that is an understatement. Defeats in mayoral elections in the Labour heartlands of Teesside and the West Midlands need to be a wake-up call for the party if it wants to prevent a disastrous loss akin to 1931 or 1983. But how can Labour turn things around? How can Labour continue to be seen as the party of the workers, Wales, the North, progressives and the UK’s urban population, as it has been for so long? There does not have to be a democratic socialist party in British politics. We need to fight for our place in the political landscape – we need to stop our own destruction. We are coming into this election from behind – and quite far behind. The Britain Elects polling average has us 18 points behind the Tories. Individual polls have shown us behind in Wales and the local elections painted a dire picture in the shires, Scotland and the west Midlands. It often seems hard to remain positive through all of this. But this is a key part. If we don’t believe in ourselves, how can we persuade anyone else to? When we campaign, we must campaign on our record. It is strong and we have 229 talented MPs who have fantastic experience as champions of their local communities. Alongside that, we have an excellent record from when we were in power. The previous Labour administration oversaw 32,000 more doctors and 85,000 more nurses join the NHS, lifted 600,000 children out of poverty, reached the Good Friday agreement for peace in Northern Ireland, scrapped section 28, achieved equal age of consent and made huge strides toward LGBT equality, delivered Sure Start and so much more. Between our time in government and our passionate local MPs we have a record of which we can be proud – and that is the message we must give to voters on the doorstep. We need to stop pretending this election is not about Brexit. The Tories won’t stop talking about it because they know they win the argument. They have made their plan clear – and it is dangerous. Labour needs to prove that it wants to be the party in power. To prove we are a government in waiting, we need to lay out a clear roadmap for Brexit. Labour needs to show it is going to be able to deliver a Brexit that will work. Our message so far has been a little confused. People aren’t clear on the doorstep, or even in the media, about our stance. This needs to change, now. That’s how to prove we are serious in our candidacy for getting to Downing Street. We need to show we are not going to be reckless in rushing to a hard Brexit like the Tories. We need to provide an alternative. This means sufficient access to the single market for the middle-England supporters Labour risk losing to the Lib Dems. It also means a deal which sees Britain leave the EU and which has an impact on immigration to prove to working class voters that Labour are listening. For the first time in a long time, Labour are at risk of losing these votes to the Conservatives. It is vital we have a compromise will protect Britain’s economy, while keeping our party on its feet on June 8. The party’s policies are popular, that’s a fact. People respond well to the “the system isn’t working” narrative. So why aren’t we winning? It’s because Labour has embarrassed itself too many times. Whether it be Dawn Butler’s “rigged democracy” comment, or Diane Abbot’s “£30 police officers”, Labour politicians have received more coverage when they have got into difficulty. The media monster is fed by gaffes like this – and you will notice that the Tories don’t really have them. Purdah rules mean the parties have to be provided with an equal balance on television airtime – so when gaffes distract from policy launches then the message does not get through. Tighten the screws, and learn the script, because otherwise our policies will not reach people. And that will lose us the election. There are no two ways about it: Jeremy Corbyn is unpopular. But it’s no good cursing the clouds because it’s raining – get a raincoat and deal with it. There are two ways of doing this. Firstly, Corbyn needs to be seen to be meeting more real people. It’s not good enough to only hold events for Labour supporters. Alongside those, Corbyn needs more and more airtime of him on the street, in workplaces, and knocking on doors meeting real people. Corbyn is a notoriously good doorstep campaigner – so let’s use that to our advantage. Tim Farron’s heated encounter with a Brexit voter gave him a lot of positive coverage – and Corbyn could do with some of that. Secondly, Corbyn needs to diversify his media appearances. Just news interviews and Sunday political programmes are not good enough. Talk shows watched by middle England and middle-aged voters should be the target, because they are who Labour need to win the election – anything from Loose Women to The Graham Norton Show will display the human side of the leader. Labour is proud to be the largest political movement in western Europe. With 500,000 members, we outnumber the Tories 3:1 and the Liberals 5:1 – and yet they are not all on the doorstep. Clicktivism that excludes doorknocking will not win any elections – but an army of volunteers can change fortunes. The best way to win voters over to the party is to speak to them face to face. 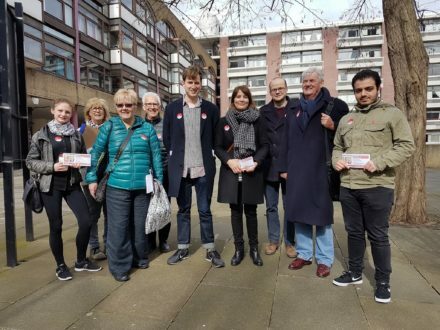 If we want to have any chance of winning on June 8 then we need to knock on as many doors as possible, host as many street stalls as we can and hand out an unbelievable number of leaflets. If you are a Labour member able to go and campaign, and you are yet to do so, then Labour’s poor performance in the locals is as much your fault as anyone else’s. That’s the long and short of it. Now this is nothing groundbreaking, I know, but if we only do those five things will we have a chance of avoiding the dire result that many members fear. In the words of Frank Underwood, “You are entitled to nothing”, so it’s up to us to earn it.